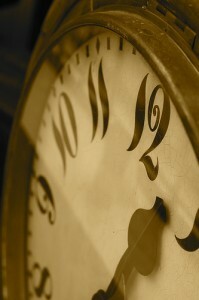 May 31, 2012 | Posted by Lee C.
You are busy. Every day takes energy and there is a lot to do. You make lists and check off tasks, feel a sense of accomplishment and sleepiness. Is sleep on your to-do list? Or, is sleep the thing you do once everything else is done, often short changing yourself? Sleep is important for optimal health, safety, and just plain feeling good. So, if you are going to prioritize for sleep you need to know how much is enough. Unfortunately, the answer isn’t so clear cut. According to the National Sleep Foundation, individuals have different needs. Different stages of life also have different needs. Genes and temperament determine how much sleep a person needs, but there are parameters. For adults, 18 years and older, research seems to indicate that while one person may thrive on seven hours of sleep and another on nine hours, five hours is not enough and more than nine hours is too much. Sleeping less than five hours can lead to health problems, obesity, and danger due to lack of wakefulness while driving. Consistently sleeping more than nine hours and still feeling exhausted may mean you have some other underlaying health problem. However, the National Sleep Foundation suggests that there is also a sort of “sleep bank.” If you have not had sufficient amounts of sleep, you may need to sleep more to catch up and pay off your “sleep debt.” Once you are caught up you maybe able to cut back on the amount of time you spend sleeping. Some people may feel that sleeping is a waste of time, but the truth is you will be more productive with the time spent awake, if you are well rested. So, how do you get enough? Everyone has natural cycles of sleepiness and wakefulness. Determine the time at night when you feel naturally sleepy. Use this time to wind down and go to bed. If you like lists, the National Sleep Foundation suggests you write sleep down on your to-do list and cross it of right as you go to bed. If there are a few nights here and there when you can’t get enough sleep, do not become stressed about it. Remember the “sleep bank.” When you have time, you can take a nap, go to bed a little earlier the next night, or sleep in a little later. Everyone’s needs are different, but everyone needs a good night of sleep. How much sleep do you need? What do you do to get a productive night of sleep? 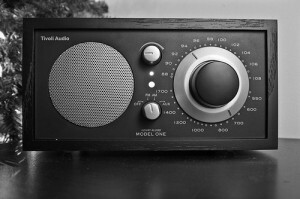 May 30, 2012 | Posted by Lee C.
You may have heard of a white noise machine or that white noise can help you sleep. But what is white noise and why does it work? White noise, according to HowStuffWorks.com, is a combination of all different frequencies of sound being emitted at the same time. It is called white noise because it works similarly to white light. As white light contains all the different colors in the spectrum, so does white noise contain all of the different sound frequencies. It is effective at blocking out other noise because your brain cannot distinguish that many different frequencies. It will not be distracted by other noise, simply because it cannot separate it from the hum of all the frequencies together that is created in white noise. So, if you are trying to sleep in a place where there is a lot of commotion, other conversation, or traffic noise; white noise may be what you need to get a restful night sleep. If you are already sleeping somewhere quiet, white noise may not make any difference in the quality of your sleep. There are also variations of white noise. One example is pink noise. Pink noise is filtered from white noise. WiseGeek discusses that pink noise is based on octaves and emphasizes lower tones. Because of these qualities it is more effective at blocking out lower noises such as rumbling trucks. Pure white noise will sound like static and recordings can be purchased to assist with sleep. Other sounds have a similar effect to white noise, such as a fan or vacuum. Some people may find sounds such as rainfall, ocean or nature noises, like crickets, helpful for relaxation and falling asleep, however, they do not necessarily block out noise in the same manner as white noise. If you have had trouble sleeping because your neighbor’s dog has been barking or a loud truck has been roaring up and down your street, try using white noise to block out the disturbance. You may get a better night’s sleep and improve neighborhood relations! Are Tempur-pedic mattresses worth the extra cost? Tempur-pedic mattresses are often thought to be high quality mattresses that satisfy many sleepers. But, if you are looking for a new mattress, you want to know for sure the mattress is worth the extra money. Unfortunately, even among the most high quality mattresses, there is no easy way to know if you’ve found the perfect mattress until you try it out for yourself. Everyone’s mattress needs and preferences are different, so only you can decide if a mattress is right for you. That said, here are a few tidbits of information that could help you make that decision. A Tempur-pedic mattress is made from memory foam. Other mattresses on the market today are made from latex, springs with padding on top, and pockets of air. Memory foam is unique in that it responds to heat and pressure. When you lay down, it forms to your body, minimizing pressure on your joints and keeping your spine aligned. When you get up again, it returns to its original shape. This feature extends the life of a memory foam mattress compared to other types of mattresses because it does not sag in areas of repeated use. This feature can also reduce back and joint pain. In addition, because the foam only moves where there is pressure, it prevents partners from feeling movement, giving people who share a bed more quality sleep. Another advantage of memory foam is that it is hypoallergenic. Dust mites, a common allergy irritant, cannot live in memory foam. If you suffer from allergies you may benefit greatly from memory foam. There are a few down sides to memory foam. The biggest complaint is often heat. Memory foam retains heat around the body, which can lead to discomfort. Another problem is that it becomes stiffer in colder temperatures. If you live in a cold climate and turn the heat down at night, it may take the mattress significantly longer to form to your body. Memoryfoammattress.org warns that while many mattresses claim to offer cooling features, they often fail to circulate air through the memory foam to the body. If you decide that memory foam will meet your sleep needs,Tempur-pedic is one of the highest quality memory foam mattresses available. Tempur-pedic is the original creator of memory foam mattress and remains the best. Consumer Reports rates Tempur-pedic as the highest quality reviewed mattress. Memoryfoammattress.org warns that other mattresses often don’t use as high quality foam, and while they may initially feel similar, over time Tempur-pedic will continue to perform while others flatten out. Tempur-pedic is worth the cost for the quality memory foam it offers. Be sure to test it out before you make the purchase so you can know definitively that memory foam is the right choice for you. Some pillows are designed for utility and comfort, while others for decorations. If you would like to try your hand at sewing, crafting a pillow cover is a great place to start. You can hone your sewing skills with a fast, simple project, and add color to your bedroom or couch. A four square pillow is simple to make and the materials are easy to gather. It is small enough that leftover scraps from other projects can easily be used. To start, you will need four 8 inch squares of fabric for the front and two 9.5 x 15 inch pieces of fabric for the back. The squares can be two complementary colors of fabric, or for a bolder look, four different patterns. The back should be all the same pattern or color. You can use a pattern that is the same as one of the front squares or a solid color that brings out the prints of the front squares. Simply piece the squares together. Next, finish stitch one long edge of each of the 2 pieces of the back fabric, add velcro or buttons for a closure. Baste the finished sides together. Then, sew the back to the front right sides together. Remove the basting and flip the pillow cover right side out. More detailed sewing instructions and definitions can be found at the Utah State University Cooperative Extension. This is an excellent step by step pattern, especially if you are new to sewing. Once the pillow cover is finished, you can place an old decorative pillow, a new pillow form, or batting inside. A four square pillow is a good way to re-energize and re-purpose older pillows. For extra flair, you can add decorative trims around the entire pillow. You could also add pom-poms, or tassels to the corners. 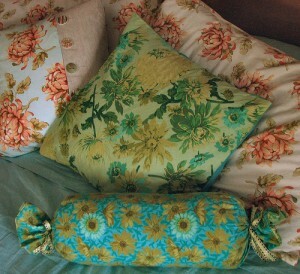 Sewing decorative buttons or beads to the front of the pillow is another way to add a design or texture to the pillow. A four square pillow can be a fun way to spruce up your own home, but it can also make a very thoughtful gift. Many people appreciate a handmade gift, and a four square pillow will add to anyone’s home decor, without eating up all of your time crafting it. Once you have mastered the four square pillow, there are any number of creative pillow cover designs you can try!